Rhode Senior Footballer’s have secured the first Semi Final spot after defeating a tough Tullamore side on Saturday evening in Clonbullogue on a score-line of 1-08 to 0-08. Rhode’s final group game takes place on Friday August 31st in Bracknagh. Team: Dean Morris, Jake Kavanagh, Eoin Rigney, James McPadden, Brian Darby, Niall Darby, Gareth McNamee, Shane Sullivan, Conor McNamee, Ciaran Heavey, Ruairi McNamee, Pauric Sullivan, Paul McPadden, Anton Sullivan, Niall McNamee. Subs Mark Rigney for Gareth McNamee, Dylan Kavanagh for Shane Sullivan, Shane Lowry for Anton Sullivan. 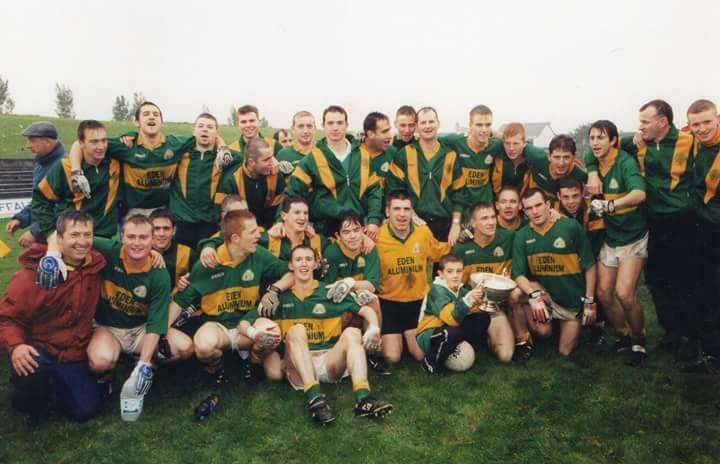 An open invite is extended to all associated with Rhode Gaa to join the 98 team, management and then club officers to commemorate the ending of a 23 year championship drought on Saturday 25th August The Village Inn Killeen’s . 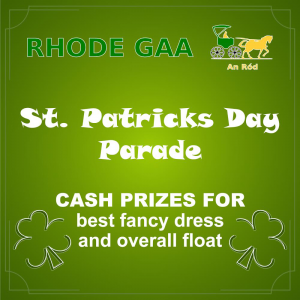 It kicks off at 6.30pm with a BBQ kindly sponsored by Colm Killeen.. Michael Duignan MC on the night will be interviewing guests and a raffle and auction for excellent prizes will be held. Any proceeds made will go towards Ród Og In keeping with the 98 vibe, John Murrin will be providing the music into the later hrs in what promises to be a great evenings entertainment. 2 All Ireland Football Tickets will be auctioned on the night. Raffle : A signed Football by the 1998 team will be raffled on the night. We are holding our 2018 GolfClassic in Castle Barna Golf Club Daingean on Saturday September 8th . Team €160 The Format is Four-ball Scramble with excellent prizes up for grabs. Join now to use our wonderful new walking track safe from the hustle and bustle of road traffic . A very happy 60th Wedding Anniversary to Podge and Mary Leavy who celebrated with their friends and family on Saturday evening last. 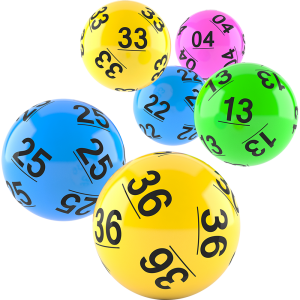 There was one winner of the Rhode GAA Lotto Draw that took place on the 13th of August for a Jackpot of €15,000 and the lucky winner was Damien Foy. The club would like to congratulate Damien on his wonderful win. It has been a week to remember for Damien as he married Michelle a few weeks ago. The numbers drawn were 5 8 10 22. The club would like to thank all those who supported the draw and thanks to Doyle’s for the use of their premises and for their help and cooperation. The following matched three numbers and received €30 each. Rhode GAA express our Deepest Sympathy to the Kerrigan Family on the passing of Bridgie Kerrigan Tubberdaly. Bridgie Will be Sadly missed by all who knew her especially her loving Family husband Benny, daughters Pamela, Tracey Sons Gordan, Brendan and Colin, sister Rosaleen, grandchildren, daughters-in-law, son-in-law, brothers-in-law, sisters-in-law, nieces, nephews, relatives, extended family relatives and friends. The Kerrigan Family as a whole have been great servants of Rhode GAA with Benny having served the club as a player and in Team Management. 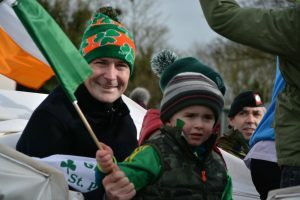 Gordon, Colin and Brendan followed suit on the playing fields and in managerial Roles with Gordon currently a coach with the Junior A team and Colin is a member of the Junior A Team. Bridgie herself was a great follower of all our teams and a great member of our club. May Bridgie Rest In Peace.